I made us some pumpkin pillows! And they sure aren’t the kind that you sleep on. 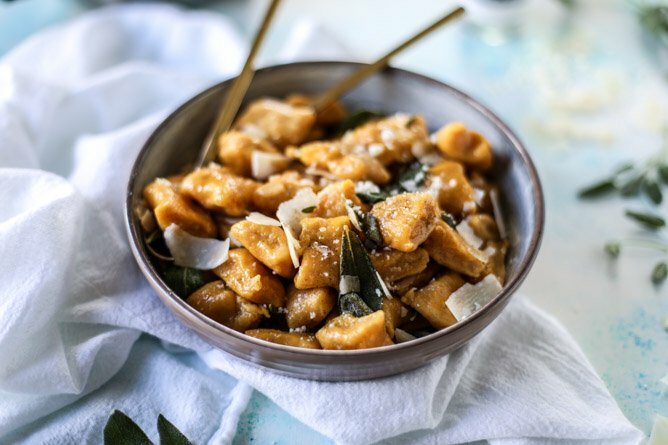 Delicious, savory and pillowy pumpkin ricotta gnocchi (called gnudi!) swimming in a brown butter sauce. With fried sage. It’s like the epitome of fall. And I can’t get enough. THIS is how pumpkin should always be! Ever since making this ricotta gnocchi this past spring, I’ve been dreaming of using pumpkin or squash and making a fall version. And using it in conjunction with the ricotta. Not instead of. 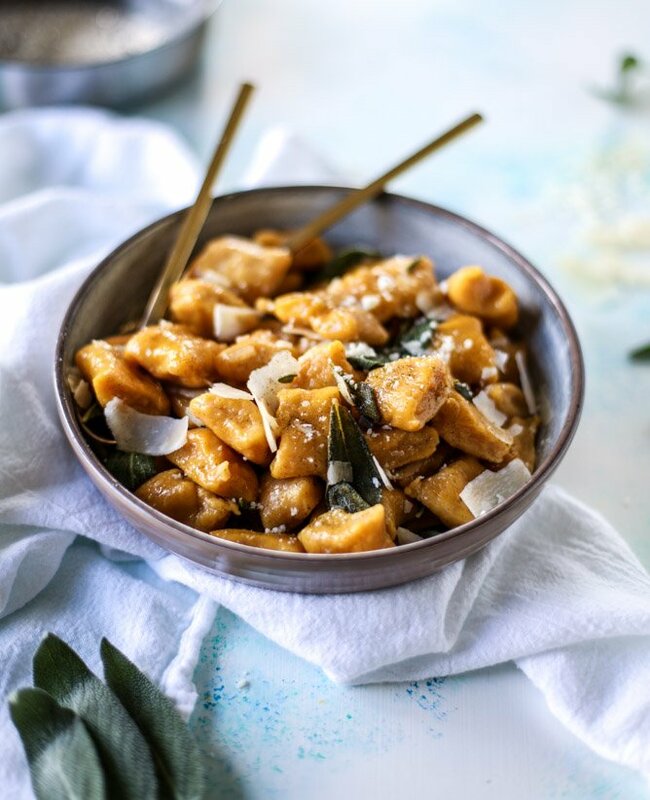 Cheesy pumpkin ricotta gnocchi is all I really need in my life. 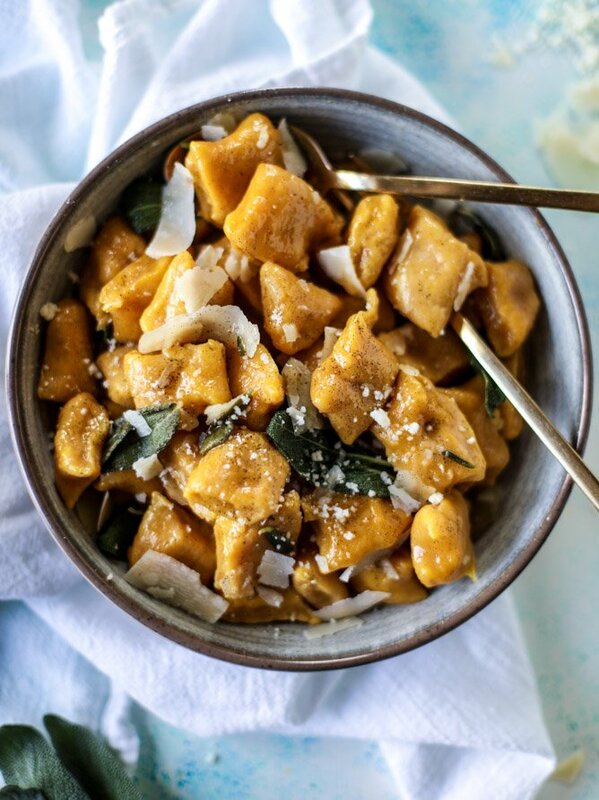 Pumpkin or squash or even sweet potato gnocchi isn’t anything new around here. 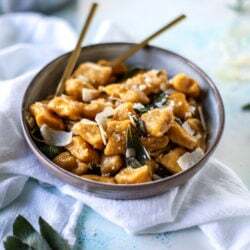 One of the first recipes I ever made for the blog, back in 2009 (hello, horrifying) was a sweet potato gnocchi – which turned into a pumpkin gnocchi. I love squash more in savory recipes than I do in sweet, so any time I can find a ravioli or gnocchi or any sort of pasta that incorporates it, I’m alllll over that. BUT. It’s going to get so much better. Because I stirred vanilla beans into my brown butter. Whaaaaat. Look at those little bean flecks! Brown butter bits AND vanilla beans. This is probably what my heaven will look like. All year I’ve been working with Rodelle to share some delicious recipes with their madagascar bourbon vanilla beans (vanilla bean chocolate ombre frosted cake! chocolate cashew coconut summer tart!) and I’ve been ridiculously excited about this savory version for months. I almost always stick to desserts when using my vanilla beans, because they are just so PRECIOUS. It’s like… if I’m going to make something fantastic with luxurious vanilla, it better be an indulgent dessert that I can share with my friends. I decided to live a little though. And use up one of my vanilla bean pods for this gnocchi that I could also share with friends. It’s dreamy. I promise. Here’s the thing: it’s not like the vanilla makes a savory recipe super sweet. It’s just the rich beans, the strong scent of vanilla, a hint of extra flavor that borders on caramelization. 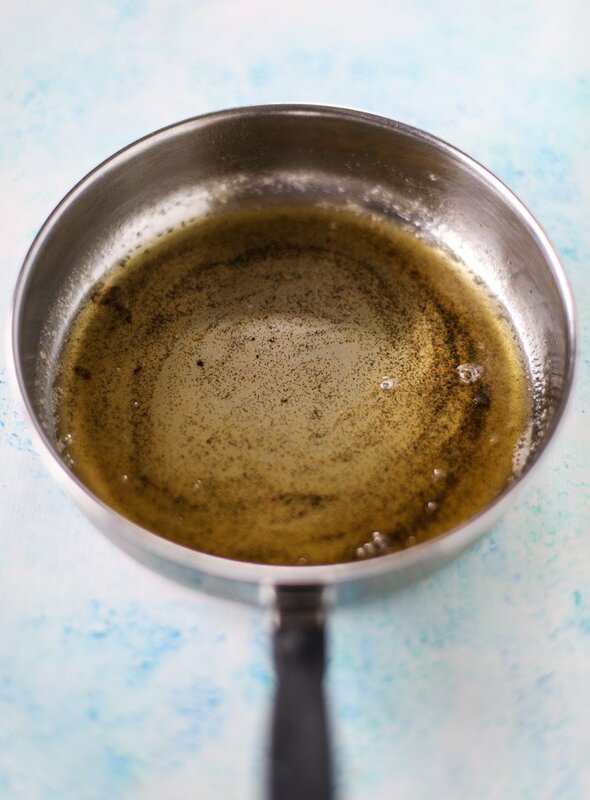 It might work better in brown butter than any other ingredient I’ve ever tried. EVER. Something that makes a dish so wonderful is when you love each separate component so much that you could easily eat it alone. And when all of those incredible components are combined, and the dish tastes out-of-this-world, it’s mind blowing. Any day of the week you could find me consuming the pumpkin gnudi, plain fried sage, brown butter through a straw (I mean, I’m sort of joking, but not) and parmesan shavings alone. Perhaps the BEST part of this meal though? It’s easy. You mix everything together in the bowl, pat it into a dough ball, roll it out and cut it. Boil the fresh pasta and drizzle it with butter that tastes like it was sent from the heavens. Cover it with butter-fried sage… does that even need an explanation? I think not. Hello my most favorite fall bowl! I even tricked Eddie into eating it. I did! These look amazing. I saw the post titled “Gnudi” on bloglovin, and then this says Gnudi and gnocchi in the post…and I mistakingly thought that Gnudi is usually free of flour so I got excited (I’m celiac). And it’s Gnocchi I think. But I think I was wrong anyways with the Gnudi. Now neither one looks like a real word the more I type it. Anyways! maybe a typo check? I sound like a jerk, I’m going to try to make these with rice flour! THEY LOOK SO GOOD GAH. I’m going to try this with GF all purpose! Also, gnocchi are made with potato and gnudi are something similar but made with ricotta. hi!! gnudi is like gnocchi but made with ricotta instead of potato. :) so ricotta gnocchi. i think it traditionally uses semolina flour. but the ricotta is the difference. yes yes, please try with rice flour!! let me know how they turn out! This sounds so perfect. I’ve been wanting to try vanilla in a savory application and this is just the green light I needed! i’m obsessed now! thanks becky!! I love that vanilla brown butter paired with this savoury dish! So delicious! I’m using it now and it’s awesome! I’ve signed up for my account and have been bringing in fat paychecks. For real, my first week I made $302 and the second week I doubled it and then it kinda snowballed to $120 a day…. wow, what a marvelous recipe, vanilla bean-brown butter and timely pumpkin puree, I’m impressed, thank you! Oh yum, Jessica! I’ve been wanting to try making gnudi…but with the pumpkin and fried sage? Yes, I think the time has come! And I’m pretty sure I’d like to bathe in the vanilla brown butter, omg! Mmm, looks delicious! Pumpkin is so good this time of year. You don’t have to trick me into eating a bowl full of this yummines! Happy feasting! You don’t have to trick me into eating a bowl full of his yummines. Happy feasting. Your son gets more adorable each day, beautiful fall pictures. This looks SO GOOD. I bought a can of pumpkin without knowing what I was going to use it for and now I know! Also, fried sage=heaven!! Semi-related: We were at a local brewery and decided ordering a keg of their delicious stout was a great idea and another great idea was to order a bunch of vanilla beans to make vanilla infused casked stout with our new keg. Amazon Prime made the bulk purchase of vanilla beans REALLY EASY, but cooler heads prevailed and we didn’t end up taking the keg home. When the package of 30 vanilla beans showed up we had so much fun using them in different recipes. We have poached a lot shrimp and fish in vanilla bean butter. Our favorite is halibut with a red curry sauce poached in vanilla bean butter. After the fish is done, I toss some zucchini in the pan to cook. You should totally try it! holy cow that sounds FANTASTIC!! Love, love, love this!! Great recipe, Jessica! I’m using it now and it’s awesome! I’ve signed up for my account and have been bringing in fat paychecks. For real, my first week I made $302 and the second week I doubled it and then it kinda snowballed to $122 a day. Looks amazing! But is it 8 oz of ricotta or 6? it’s 6 for the recipe, but you measure out 8oz and press some liquid out of it. when you weight it, it will be less than 8 and you just want to make sure that you get 6 oz after the water is pressed out! How far in advance do you think you could make the dough? I’d love to make these for thanksgiving but with two babies prepping before hand if KEY! I would love to make this recipe for a dinner party. Is it true that I can make the pillows and then freeze them for a night to cook the following night? Will it taste good?